Heart Failure (HF) is the #1 cause of hospitalization for people over age 65, and nearly 1 in 4 patients admitted to U.S. hospitals for HF are readmitted within 30 days. UbiCare's SmarteXp engagement solution for HF connects you with patients to promote self-management of this chronic disease. Reduce readmissions with patient education on managing HF, including self-monitoring of HF symptoms, treatment options, healthy lifestyle changes and available support. Improve patient knowledge and experience with digital connections spanning 1 year post-diagnosis. Meet Meaningful Use requirements for patient-specific education resources, while boosting your HCAHPS scores, fulfilling HEDIS requirements and retaining hospital revenue. Improve quality of care with evidence-based health messaging, 24/7 mobile access and comprehensive analytics. 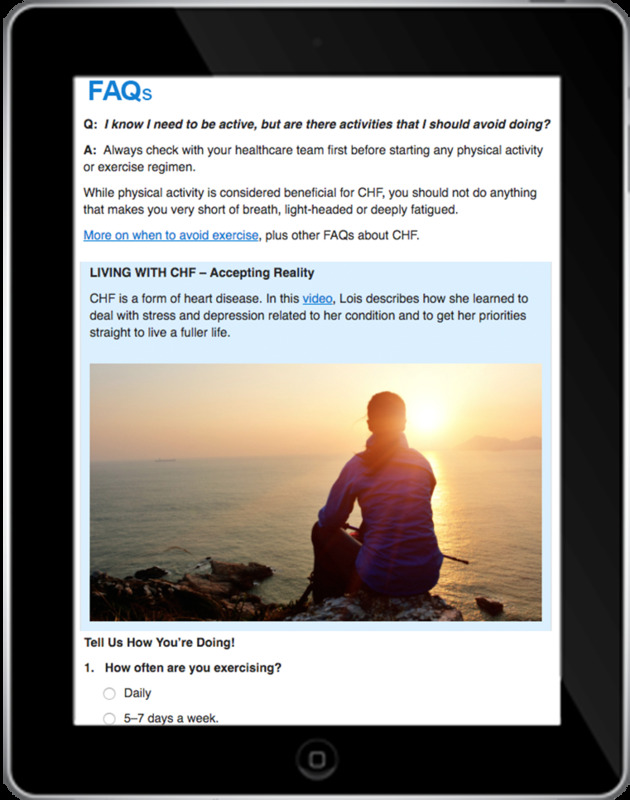 FAQs, videos and in-depth library articles on HF causes, treatment, symptom flare-ups and more. Patient diary for recording symptoms and vitals.